This is a topic close to my heart, I think because I see it as a more difficult problem to address and it’s something I’m less able to help people with but wish I could. It’s easy to help someone fix their dose- you just try going up or down, and bam, everything is better. This is not one of those scenarios. 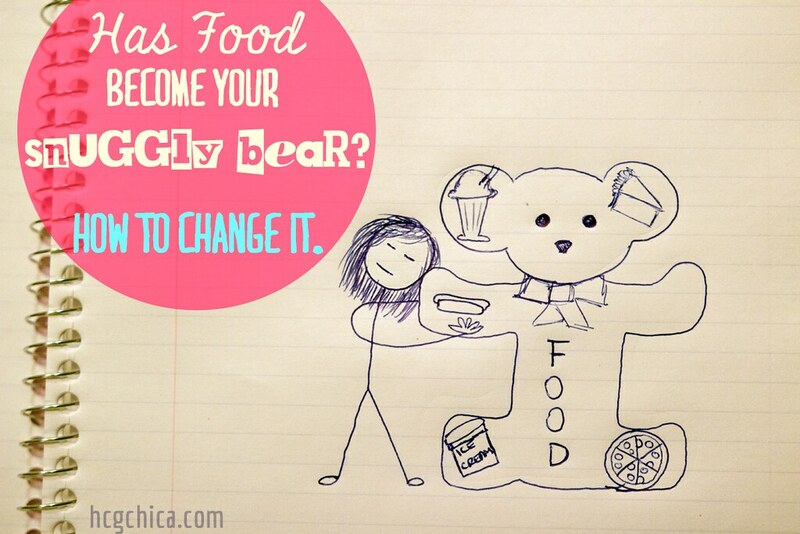 Is Food Your Snuggly Bear? 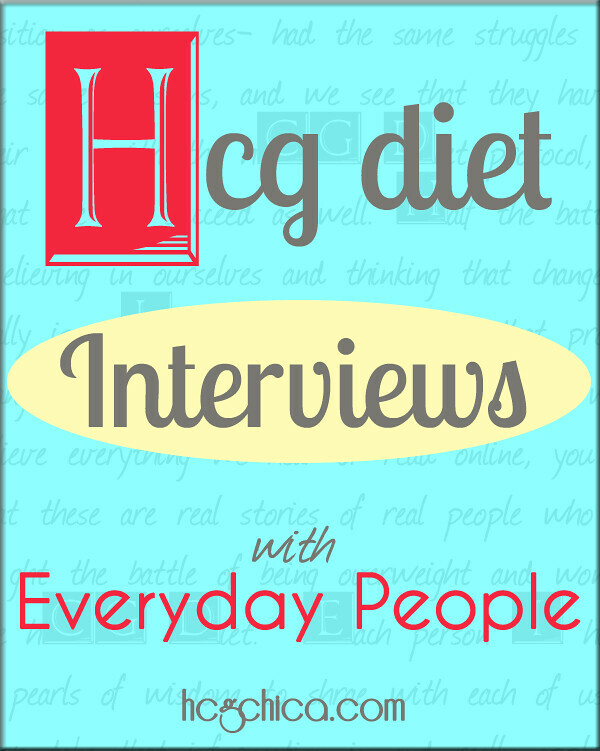 Many of us may not even realize to what extent food has become a crutch in some way until we go on the hCG Diet. And these issues are not fixable overnight. Many of us may not be aware of it because it almost becomes an extension of yourself. I have a couple of shirts that I wear ALL the time and I feel more like myself in them then in other clothes, I don’t know why. That’s okay since shirts don’t cause weight gain (yay for that! 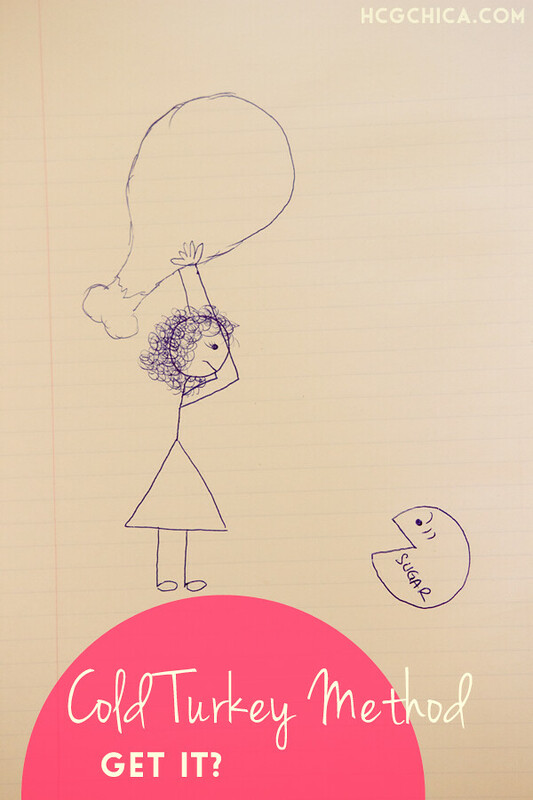 ), but food is another story. With pretty much any other diet, there are some restrictions that involve either calories, fat grams, grams of carbs, or certain food groups you can’t eat, but aside from actually fasting, I don’t think there is anything as restrictive as far as actual amounts of total food than hCG. Granted, the hCG hormone taken in the proper dose does create an effect where you really don’t feel hungry, but the problem is many of us have eaten a lot of calories in the past several years for many reasons unrelated to actual hunger. Here’s the reason I think this is significant. On a low carb diet you can usually indulge somewhat to your hearts content on low carb foods. On a low calorie diet you can fill up on lower calorie foods that are higher in fiber. A low calorie diet is usually at least double that of the calorie intake on hCG. All these other diets don’t really make it necessary for you to address a life that revolves around food– you can sort of find a way to continue using it as a crutch no matter what foods you are or are not allowed to eat. This is not to say that all other diets don’t help you- of course I’m not saying that. If you eat Paleo and get healthy and fit, obviously it’s a great outcome. What I’m saying is that for anyone who was like me and didn’t have a healthy relationship with food in general- the reasons when, why and how much I ate, you are not necessarily forced to address these issues on most other diets. Even on paleo if you don’t address your issues with food you can drown yourself in nuts. 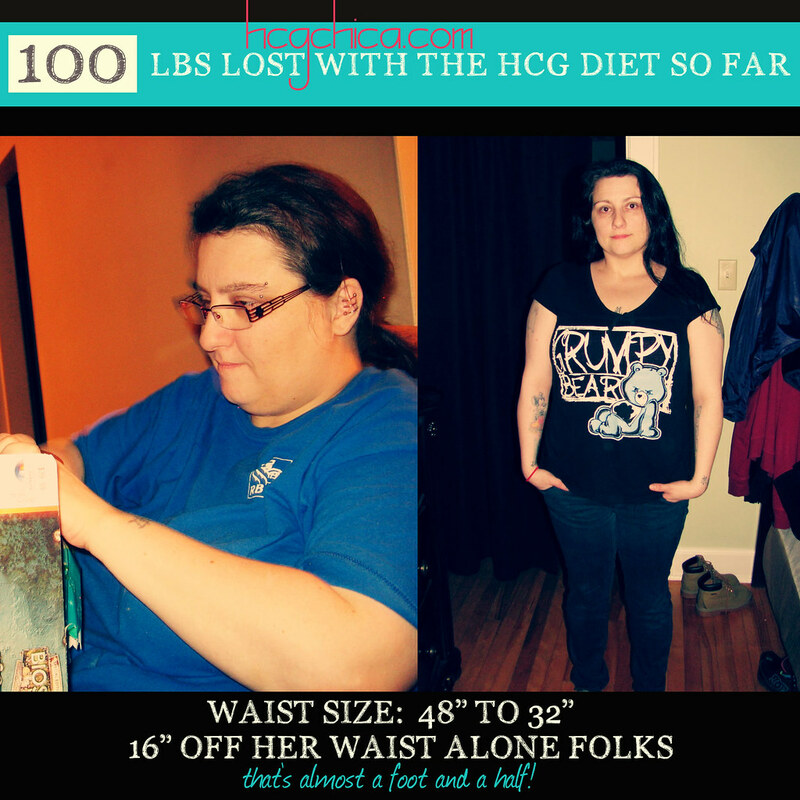 Once on hCG, the feeling is very different. It simply doesn’t take very much time out of your 24 hour day to eat 500 calories worth of food. It might take all of 15 or 20 minutes total. That leaves like 15 hrs and 45 minutes of “awake” time that you have to be busy enough and satisfied enough with the other things in your life to not need food. Additionally there is a glaringly short list of actual foods you can choose from. Very few people who come from a background of an overeating disorder or just eating too much crappy foods find steamed fennel something to rock their world. I think it can come as a shocking realization to many of us that this is really not easy. This is actually why I find it amusing that people get down on the hCG Diet saying it doesn’t teach you anything (as in long term life-eating skills) yet other diets do. I would beg to differ for the above reasons. Why Is Food Such a Big Issue?? Food is one of those things that we can easily piggyback onto other activities– eat while we work, eat while we watch a show, eat while we hang with friends, eat while we’re driving or doing errands, eat because we’re bored, eat at a catered business meeting, the list goes on and on. I have thought this to myself before and recently a fellow hCG vlogger on youtube, hcgforme2010 mentioned it- unlike other addictions like drugs or alcohol, you can’t just cut of food completely. We all do have to eat, on a daily basis. When food has become an addiction for one reason or another, how do we get rid of the addiction when we can’t get rid of food? I actually remembering wishing strongly at times in the past that food just didn’t exist. I had such a bad relationship with it and hated that it had to be part of life. I recall a relative of mine expressing the desire to simply have a pill she could swallow that would give her the sustenance she needed so food as know we know it could disappear from her life. I can only share what has helped me to break free from my bad relationship with food. If your personality is like mine, these factors may help you too. 1. Accept the process will take time and that you WILL have slip-ups. My number one mistake I think that I made over and over and over originally when it comes to food and diets and doing the right thing by my body was to completely give up when I made any one little misstep. I am what some call an all or nothing person- and I have the feeling that a lot of you probably are too if you are reading this and deal with similar difficulties in regards to food. I had to very consciously change my thinking pattern in regards to this. I had to learn that when I screwed up, instead of giving up and doing further damage, I had the ability and control to correct the mistake instead. Part of the feeling that led me to give up in the past was the feeling that a mistake I made couldn’t be undone which led to a feeling of hopelessness. Technically that is not true! While you can’t un-eat that box of cookies, you can make alterations to your future days of eating to compensate fairly quickly through things like intermittent fasting, low-carb eating, or the removal of a couple of food groups like dairy and or nuts– 3 tools which I DO use from time to time to create a balance in my life. This has really helped me to have a positive feeling overall and to keep negative emotions to a minimum when I’ve kind of overdone it in some way. This is literally the biggest key for my long term happiness and ability to keep my weight off without constant obsession over it. I tend to fear change, and my husband discovered a better method to get me to try new things- portray something as a trial instead of a permanent change– this is a more accurate way to look at things anyway because how can you know beforehand if a certain change will make you happier or feel worth it? That is the exactly the reason that I fear change- the idea that the change will make me less happy for some reason. No matter what it is whether it’s removing a food group (is sugar a food group?) or trying out a workout program- commit yourself only to 3-4 weeks as a trial. If you’re just really not digging it at the end of this time period, give yourself the out that you can drop it without guilt at that time. Now in truth, some things really take longer than 3-4 weeks to start seeing the full benefits of something, but the idea is the PERMISSION in your mind that you have freedom of choice. It is amazing how much easier it is for me to do the right thing when I don’t feel any type of invisible pressure one way or the other. If you start with the 3-4 week trial period, if it is indeed a good change, by the end you will usually be getting accustomed to the change at which point it is easier to consider continuing with the change for a longer period of time. 3. Cold Turkey or Gradual- Which Works for you personally? If you have been trying the gradual method and it’s not working, you might consider the cold turkey method. Sometimes when people hear that I don’t eat any sugar or wheat at all, they think “wow that takes so much self-control, I don’t think I could ever do that”- but actually the reason I’ve done it this way is because it’s the reverse- it’s actually EASIER to not eat sugar at all than to keep it in my life. When I try to eat small amounts sugar etc.- I CRAVE it something fierce. It’s distracting and makes me feel unhappy whenever I’m not getting as much sugar as I’d like. When it’s out of my life completely I don’t crave it at all! Seriously. It may be hard to believe but I challenge you to try it sometime. I will have an entire post on how to get away from sugar and carb addiction specifically in the future to give you the details on how I do it. The gradual method does work for some- if you’re not doing well with the cold turkey method, try gradually reducing things. One woman I interviewed privately did just that- she gradually replaced amounts and unhealthy habits- she used to eat at fast food joints 3 times a day- she removed the time of day that she was least attached to first, which for her was breakfast. She replaced regular soda with diet soda, then diet soda after awhile was replaced with flavored water, which was eventually replaced with more plain water. She gave herself time and made small changes and this worked very well for her. I learned this from the EatStopEat Book by Brad Pilon. I have tried the method where you eat clean 5-6 days a week, then have a “free day” 1-2 days a week. What did this do? At first it was fun because I had a way to justify completely letting go and doing whatever I wanted. But it caused me to spend my non-free eating days thinking about my free day- I was distracted most of the week in anticipation of my free day and all the wonderful goodies I was going to eat. Once the free day came….well honestly it would be pretty embarrassing to tell just how much and what I ate, all thinking in my head that it was “okay”. I think my liver would probably tell you otherwise. After every free day it was VERY hard to get back on track, because my system was so overloaded with carbs and sugar and in the end, I found myself having more free days than I should until I gave up. I had to learn that for me personally, there is NEVER a reason good enough to completely blow it. Not loading for hCG, not someone’s party, no. Eating right for my body in a balanced way is always the right answer to every scenario. It is SO easy to justify things in our heads about why it’s okay to do this or that. Back to how Brad Pilon’s book taught me this- while many intermittent fasting sites and books discuss following up a fast with a splurge, Brad advocated pretending the fast never happened- meaning you continue to eat in a normal balanced way, just as if you’d never done extra restrictive the previous day, giving you no license to totally splurge. This was a very new thought to me. I used to automatically turn to food when I was sad or depressed over something. And it would make me feel better. I also turned to food for lots of other reasons. I simply cannot deny the positive effect that having this blog and my youtube channel has had on my life and eating habits. And I will be honest- before I started “working” on this, I was a full time stay at home mom. I love my son dearly. So so much. But there were a period of time where I had nothing for myself- nothing to feel proud of that related to my own accomplishment, nothing that really re-fueled my own soul. Being a mommy is rewarding in it’s own way, but I’d still say the majority of the job, especially the first couple years at least, is 95% about GIVING. And they give about 5% back by little things like smiles, cuddling, baby laughter, and all their cute milestones. Now that my son is 4 years old he gives back even more I think- we can actually have full on conversations that are quite enjoyable! But a few years ago, my husband worked many hours since I stayed at home, and it was often just him and me, from 7a.m. to 8p.m., everyday, giving of myself 95% all day long, with not much coming back in to re-fuel me. It was tough. I realize that many of us are quite busy- perhaps you feel there isn’t time or energy to find something to do, whether for fun or work that you can be passionate about. But I encourage you to not dismiss the idea before you’ve spent a little time hashing it out and brainstorming. Everyone is going to be different, but my little inner being seems to need to do certain types of activities that make me feel productive. I love both raising my son and working part-time doing something I’m passionate about. For me it is the perfect balance. But maybe you don’t have the circumstances to create such an situation. In most cases there will never be a perfect situation where you have everything just as you need or want it. But I firmly believe in making adjustments, and getting creative with this, in order to find a way to feed your soul. You NEED this ladies. My crossfit has a kids area now- I can go any time and crossfit now which fuels my mind and body, and take my son along where he can play at the same time. Just check into different things- even if it’s not a long time- just being ALONE for 15-20 minutes can be so rejuvenating. I love this- I really think he is right- you need some alone time, even if it’s short. Stay tuned for the discussion in this series which is the 6th reason for failure on the hCG Diet- how undiscovered health issues can play a role. I have a emotional eating….i have not be able to stick to a P2 longer than 7 days…than i cheat and after that i stop completely w P2 . I felt a failure. So glad you fixed the video. Love the background. Looks like you quilt or sew. I quilt. If people can start thinking about food as fuel for the body and look for pleasure elsewhere in life, I think that would help. At least during VLCP it’s helping me a lot. I don’t care so much what I eat or don’t eat right now. I’m focused on all the good changes that are happening in my life physically and emotionally.Facing the daily battles with optimism. Detaching from food mentally is a huge challenge. Rewiring your brain to seek to decompress and relax and find pleasure in things other than food really takes time, but it’s not impossible. One thing I’m discovering is that it is totally possible to feel satisfied on P2 food and seek other activities to replace food emotionally. P2 is a time of change and healing. It’s a time for looking inward and finding out who you really are apart from food. Like anything else 23-43 days is just that, time that passes by. Whether you let your body heal and your brain reset and start over is up to you. How? by following the protocol and looking at this phase like a personal journey into healing and positive change, being patient with your body while it makes the necessary changes and gives you the responses that you want which may reflect on the scale, a smaller jean size or better yet acceptance of who you are and most importantly perhaps finding peace with food. Yes I quilt! One of my favorite hobbies- although been so busy the past couple years that the fabric has been sitting waiting for me- but I made a lot of quilts in the 4 years or so prior to that- it was healing. And excellent thoughts to add thank you so much! So great for everyone to read. And like you said- difficult to do the rewiring, but not impossible- I too never thought I could make such vast changes, but I really have. Thanks for sharing your experience. Good to hear Joanne! I know it's kind of a like a bootcamp isn't it for making changes.